The mainstream press talking heads that repeatedly rely on near always wrong ivory tower academics that is further regurgitated at length by the BlogosFear will today be focused on the latest utterances from Fed Chairman, Ben Bernanke, as if by magic he is going to pull new rabbits out of the hat that will surprise the financial markets with rumours of the early end of QE2. The facts are that the vast majority of academics and financial press talking heads have been wrong on QE since it started in March 2009, who recently with the benefit of hindsight looking in the rear view mirrors state that the rally in stocks and commodities has been purely as a consequence of QE1 and QE2, despite the fact that for want of a better word, these fools had during 2009 been stating that QE would NOT be able to prevent DEFLATION and stocks and commodities would FALL as a consequence of their perma deflation propaganda, additionally these fools had stated during early 2010 that QE had come to an END and that there would be NO QE2 (Google their name + QE 2009). Of late many of these deflation fools have been attempting to reinvent themselves with the benefit of hindsight of a 100% run up in stock prices that they have not only missed but have been actively advocating the betting against to recognise aspects of the Inflation Mega-trend in a luke warm manner as they are in able to abandon the red herring theory of debt deleveraging deflation as I warned of right at the start of the current phase of the Inflation Mega-Trend in November 2009 (18 Nov 2009 - Deflationists Are WRONG, Prepare for the INFLATION Mega-Trend ). Why do deflationists have it wrong ? It is that focusing on the deleveraging of the the debt mountain is a red herring, taken on its own then yes it DOES imply deflation as the debt bubble 'should' contract. But given the asset price reaction of 2009 that is NOT what is actually taking place! the Debt bubble is NOT deleveraging, the bad debts are being dumped onto the tax payers! The huge derivatives positions that act as the icebergs under the ocean as compared to the asset price tips that we see above water are not contracting but expanding! The actual reality of the so called great deflation of the past 2-3 years is revealed by the below graph for US CPI inflation that makes a mockery of such deflation commentary that amounts to nothing more than perpetuating central bank propaganda. These talking head sales men that encompass near 99% of that which is published and effectively succeed in drowning out that which could be useful have demonstrated that they are as much as 2 years behind the curve in which respect readers and viewers are probably better off not reading ANY published analysis or viewing any broadcast programme on the financial markets as there is a 99% probability that it is DEAD WRONG, your really far better off flipping a coin as then at least you have a 50/50 chance of being right as opposed to listening to clueless talking heads. Many of the talking heads are suggesting that Bernanke will announce an end to QE2 today, my view on QE money printing has remained constant for several years now in that once money printing starts it cannot end whilst large budget deficits persist which means that QE3 will soon follow the scheduled end of QE2 in June. The strategy remains for the central bank to play its part in inflating public debt away by means of high real inflation that erodes purchasing power of wages and lifetime accumulated savings and wealth as covered at length by the 100 page Inflation Mega-Trend Ebook of January 2010 (FREE DOWNLOAD). Therefore I expect Bernanke to continue to pump out deflation propaganda such as focusing on core inflation that excludes food and energy costs because off course everyone has stopped feeding and heating themselves, so as to allow the Fed to continue with the stealth debt default of US Debt by means of high real inflation. As I have stated several times during the past few years, IGNORE central bank propaganda statements on QE ending, or not continuing because it is a LIE, there WILL be QE3, no matter what the Fed says as the Fed statements are nothing more than economic propaganda to focus on managing the general populations inflation expectations. Where the markets are concerned The QE debate boils down to two fundamentals positions of those that are riding and profiting from the stocks and commodities bull markets against those of perma-bear persuasion that not only consistently miss whole bull markets but give up all of any gains they may have made during preceding bear markets. This factor encompasses 99% of the debate that goes on across the Blogosfear. Now whilst some may conclude that it is a case of perma-bears arguing against perma-bulls, however that is not quite accurate for in a bull market Investors SHOULD be a BULL, likewise in a bear market, investors should be bears, because that is how one preserves and grows ones wealth and not by betting against EITHER bull or bear markets. Whilst Everyone now several years on with the benefit of hindsight recognises the importance of QE, though in simplistic and in herd like instincts elevated to exclusivity status when in actual fact it is just one of many possible HINDSIGHT reasons that can be used to explain market price action AFTER the fact much as I suggested would occur right at the birth of the stocks stealth bull market in mid March 2009 (15 Mar 2009 - Stealth Bull Market Follows Stocks Bear Market Bottom at Dow 6,470 ). More on QE as excerpted from the recent Stocks Stealth Bull Market Ebook Download Now-(PDF 2.8meg), the only requirement is a valid email address. U.S. politicians are living in fantasy land where they think they can get away with printing money and debasing the dollar without any consequences, they either do not care because they have become rich on the cash funneled to them by their bankster masters who they serve, or that they are delusional, completely detached from the real world. Many countries in the past thought the same, Germany, Russia, Italy, Zimbabwe to name a few and they ALL economically collapsed leaving the holders of their currencies with worthless paper to sell on ebay as high denomination trinkets, though off course the US dollar has already lost over 90% of its value during the past 100 years as a consequence of the stealth debt default through Inflation. The stealth theft of wealth by means of high real inflation has been getting another accelerant these past 2 years ( in addition to public debt and POMO) in the form of direct money printing (electronic) by the US Fed to the tune of $2.3 trillion to first buy mortgage backed securities and then monetize the U.S. budget deficit that comes in at an annual $1.5 trillion and likely to continue at approx 1.5 trillion a year for a decade, that requires direct purchases by the Fed because no one else is dumb enough to buy the literal flood of paper, in fact now over 70% of new debt issuance is purchased by the Fed with most of the rest by other money printing central banks. Whilst $2.3 trillion may not sound like a lot given the size of the approx $15 trillion annual GDP U.S. economy, but we are living in a fiat currency world where fractional reserve banking allows the banks to create credit at more than X10 the electronic print run and many, many times more during the pre-credit crisis credit boom. Where's the money gone ? Well not much into loans to main street but it has into assets on leverage such as commodities and stocks and off course the Fed's bankster brethren making over a trillion in risk free profits on buying US government backed bonds such as Treasuries and mortgage backed securities, U.S. tax payer funded profits without risk. This is why the past year has seen virtually every analyst jump on board the QE bandwagon as a rear view mirror explanation for why stocks have soared, though backtrack to Feb / March 2009 and quite a number of these same so called analysts were explaining at length why QE meant that stocks would NOT RISE ! (Google it). Worse still, a year into the stocks stealth bull market trend (March 2010) these same analysts were excitedly stipulating that the Fed had indicated that QE had come to an end and had started to unwind its positions and therefore implying that the so called bear market rally was over, following which along came the start of QE2 in November 2010, these same analysts are now suggesting that there will be no QE3. No wonder 90% of traders and many investors are on the losing end of trends because approx 95% of what they are reading is garbage pumped out by nothing more than sales men, academics, journalists or frankly media whores. The record is all there on Google to be confirmed within a minute or so. So as I say ALWAYS say, research each analysts past record before you pay any attention to their most recent diatribe. For it is always easy to pump out propaganda in support of ones pre-existing perma-view usually pushing sales but infinitely more difficult to arrive at a probable trend conclusion. So whilst so called analysts had convinced themselves during early 2010 that QE had come to an end. However my conclusion has remained the same for over 2 years now that once Quantitative Easing starts it CANNOT END whilst large budget deficits exist regardless of what the central bankers publically state, as their focus is in massaging the expectations of the general population and financial markets with regards positive expectations on the economy and inflation and NOT in publicising accurate projections, as that would make their jobs much harder as I elaborated upon during mid 2010 (13 Aug 2010 - The Real Reason for Bank of England's Worthless CPI Inflation Forecasts ). The facts are and have remained for two years now that QE is INFLATIONARY (which is why I termed it as Quantitative Inflation in March 2009), which ultimately means HIGHER Commodity Prices ($ oil is not soaring just because of political unrest), Consumer Prices, Asset Prices and eventually Interest Rates (covered in the bonds section). Though it's not just the U.S., ALL countries are at it, any economic problem and they press the print money button because it is far easier politically to print money (stealth theft of purchasing power) then to raise taxes / interest rates. The whole point of QE money printing asset buying was to generate economic growth by means of boosting the wealth effect. What the central bankers such as the Fed and BoE never factored into their formulae's was that their bankster brethren would use the cheap money to buy commodities on leverage rather than make loans to main street, hence sending asset and commodity prices soaring well beyond even the real inflation rates of between 7% and 9%, despite the fact that they did the exact same thing during mid 2008 to crude oil. Yes there is a wealth effect for the bankster's and the few who have been able to bite the bullet and get on board the stocks stealth bull market and commodities, with prices being inflated by bankster's courtesy of central bank easy money. Inflation Time Bomb - Each QE builds up inflationary pressures in the U.S. economy that act as a ticking time bomb primed to go off, I cannot over state how inflationary QE is for an economy, even if QE stops at $2.3 trillion (which I doubt) then that pressure will remain, the ignition for it will probably ironically lie with rising short-term interest rates because QE induced near zero short rates have actually acted to suppress economic activity as the expanded Fed balance sheet has acted to soak up excess dollars and thus acted to suppress consumer price inflation whilst boosting asset price inflation, however as noted elsewhere in this ebook it is gradually leaking or flooding back into consumer price inflation via mechanisms such as foreign capital flows. At the end of the day QE of $2.3 trillion will eventually translate into new fiat currency money supply of between $20 trillion and $40 trillion, in a gradual process of inflation leakage as U.S. CPI that inexplicably to the mainstream financial press trends ever higher. 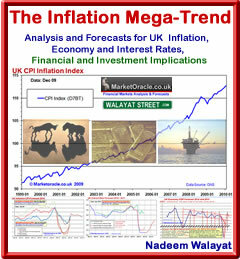 Throw in several more QE's and those numbers can be doubled yet again which illustrates the ticking inflation time bomb. If for whatever reason the Fed takes fright to the inflation monster it has created and suspends QE at or near current levels then that still would require QE to be unwound to eliminate the inflation monster that would still be enough to send U.S. CPI soaring as short-term interest rates rose. The net effect would be for the US bond market to plunge or even crash taking the dollar down by several notches with it - ALL INFLATIONARY. There really is no way out for the Fed, for if they continue QE its inflationary if they suspend QE and raise interest rates its still inflationary, hence Inflation is a ticking time bomb in the U.S. that WILL explode. PIMCO - has reportedly dumped all of its U.S. Treasury Bonds, in response to the expected end of QE, the Blogosfear ran and cried panic for stocks and more importantly bonds to imply that there will be no more QE! - Well that's not going to happen whilst large deficits exist that require the central bank (Fed) to monetize debt (buy government bonds). Instead, if Pimco and other bond funds are liquidating treasuries then where are they going to invest ? Yes I know they will likely hold a lot of cash as a stop gap, and apart from shorting treasuries which I have been advocating since August 2010, it seems obvious to me that instead of investing in bonds Pimco is going to invest in equities, as the always rear view mirror looking financial press will only see AFTER the fact - perhaps some 6 months down the road when perhaps the Dow has added on another 2k then the headlines will be PIMCO sold bonds to buy stocks ! Download Now- The Stocks Stealth Bull Market Update 2011 Ebook (PDF 2.8meg), the only requirement is a valid email address. basically what i'm getting at nadeem is do you see much potential for this "risk off period" between qe's of causing a rush for exits and stock fall greater than what occured in spring 2010 (UNTIL FED rolled out qe lite. the reason i am slightly concerned is that margin debt has been continually growing and i would think people may rush for exits sometime in june....and catch fed sleepin. Great work as always. Wanted to ask you if you are still bearish on property in the UK with rates rising soon, or is it still a decent time for a buy to let investor to break even with inflation? I am about to start a flood of analysis on the UK housing market tthat will conclude in a detailed trend forecast by hopefully late June 2011. The Dollar has started a rally without reaching to low of 69 or 70. Do you think we have seen the low for this year ?